There are two different styles of stock market analysis. The first, fundamental analysis, is based on taking a look at a company's business and figuring out if its stock is cheap or expensive based on expected earnings. For example, let's look at Apple. The fundamental analyst would try to go through the Cupertino based firm's supply chain and try to figure out how much profit Apple is making on each device in its line up. Then, the analyst would estimate the sales for each product and compile a earnings forecast. Apple's earnings would be divided by the number of shares outstanding. This would then produce the Earnings Per Share number which the stock price is then divided into which results in the Price Earnings ratio or P/E. If the P/E is lower than other similar companies, a case could be made for the stock being cheap and a buy. If the P/E is higher than the figure for similar firms, the stock would be considered overvalued and a sell. With a PE of 17, the Cupertino based firm has a P/E lower than the 50 to 100 readings that past leaders have have, but is higher than other tech manufacturers in the same business. As you can see, fundamental analysis is complex and is often wrong. After all, who can figure out exactly how many iPhones Apple will sell in a year and know exactly what it will cost to produce them. Another form of analysis is based on the theory that everything you need to know to see where a stock is heading to can be seen just by watching the stock trade. The tool of the technical analyst are charts and the idea here is that a stock's trend continues in the same direction until it starts to move the opposite way. One of the most complicated and complex forms of technical analysis is the Elliott Wave Theory devised by Ralph Elliott in the late 1930's. 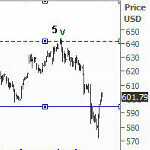 Elliott says a complete cycle for a stock is composed of 5 up trends alternating with 3 down trends. Using the golden rule based on the fibonacci series, the time and magnitude of each wave can be computed. 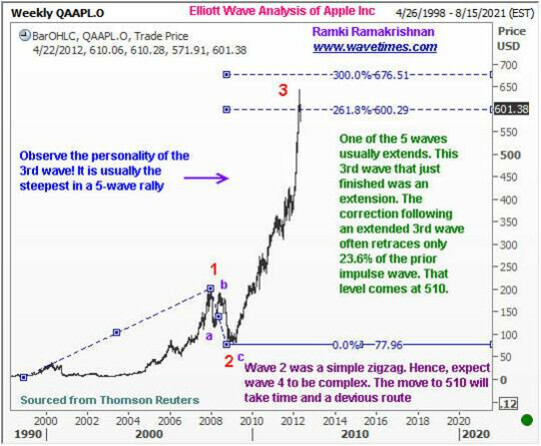 As precise as Elliott Wave seems to be, there are a number of exceptions that can happen which will allow an "E-Wave count" to be considered on target even if the actual forecast is wrong. Terms like "fifth-wave extension" may seem like a cop-out, which is why many traders do not put much, ahem, stock in Elliott. 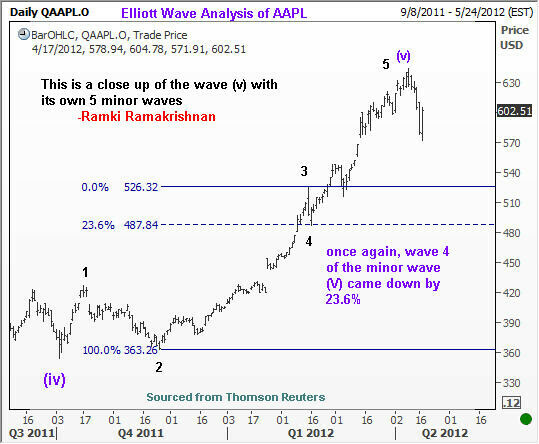 Based on analysis by Ramki Ramakrishnan, Apple's stock has currently completed the third up wave in its current cycle. 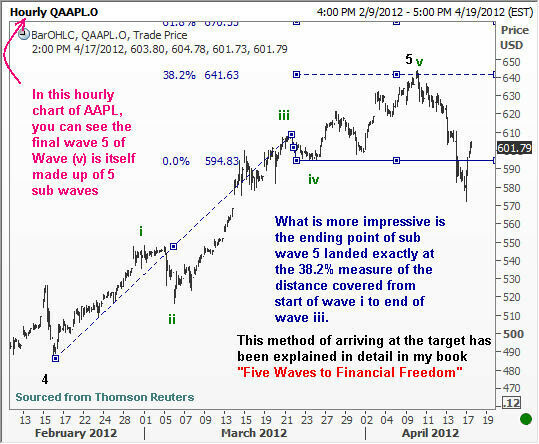 Wave 3 is usually the largest wave of the 5 wave up cycle and took the stock from $75 to $650 in a simple pattern. Based on Elliott's law of alternation, this means the next wave will be a complex one and often correctsw 23.6% of the prior move. That would take the stock down to $510 from its current $608. What makes Elliott Wave so challenging is determining exactly where a stock stands in the current wave count. Each up wave can be divided into smaller 5-3-5 cycles and this also makes things difficult. On the other hand, once you lock into a wave count, you can make forecasts that seem as accurate as having tomorrow's Wall Street Journal today. As detailed in the charts below, the end of sub-wave five was exactly 38.2% of the move from the start of wave i to the end of sub-wave iii. a practicing Elliottician would have seen this in advance and would have had orders in to buy puts or sell the stock short at this price. 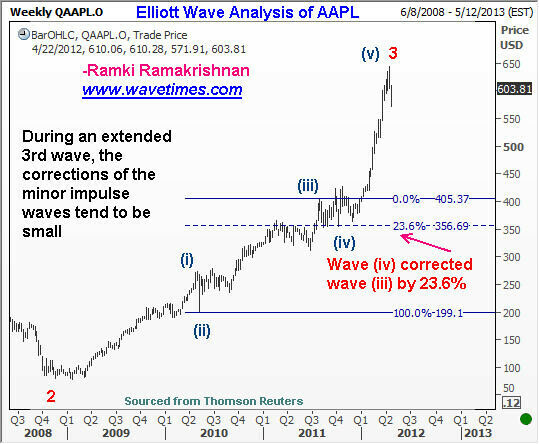 The beauty of Elliott Wave is that if you are wrong with your analysis, you know right away and can make corrections. The current wave count for Apple by Ramarkrishnan suggests that the stock is ready to drop about $100 from the current price of $608 to $510. We certainly are not making any recommendations, but what is interesting is that if this analysis is correct and Apple does drop to $510, what happens next? Remember, at least one analyst has slapped a four digit price target on Apple's stock while another is looking for the decline to continue. wow. that was one of the geekiest articles in a while. I liked it.. I think I actually just learned something completely new. actually yeah. and who knows its just the begining of the end. i really hope for judgement to come soon for rotten fruit inc. Regardless Apple has performed admirably, and very impressively period. I hate how they do it i.e patent trolling, poor labor enforcement, lack of individual mods without jail breaking etc., but admire what they have done in the same breadth. They changed the the way we interact with the PCS handset look and function single handedly....you have to acknowledge and admire that in spite of any personal feelings! Agreed... +1 I don't like how it happens, but it is lethal genius, all the way. i admire what they did with original iphone but after that its all BS what they have been doing. instead of innovating they been doing all the sh*t things. i just hate the culture of the company. they `ll do anything for higher profit margins, irrespective of right and wrong. overall they have failed to bring any real values to humanity. True!! There is no values in that company, and that started from day 1 when jobs tricked woz and didn't pay him all his money. They are rotten and corrupt from CEO all the way down. Humanity is not welcome there!! ... and now "the Woz" has a Nokia Lumia 900, whaddaya know! Go figure... I don't think everyone at Apple is pure evil... I mean, I'm sure they have plenty of hard-working folks there who are just following orders and doing their job... I say the top is certainly good at figuring out how to succeed by sucker-punching the rest of the industry in the mouth, and then hands down their orders to the good (but semi-clueless) workers beneath them. lol, apparently ive been missing quite the conversation. apple and ethics have never gone together. its always been about steve's narrow vision and everything else was just cannon fodder... be it employees, customers, or businesses. Yea, there are very few accidents in apple. everything is executed to a degree that very few companies can compare to. The problem is, without any ethics, you hurt a lot of people along the way... which is exactly what Apple has done. I cant stand their culture and business model. With a little luck, Cook will change that. He seems to be regularly taking steps in a better direction so we'll see. sorry, i mean judgement day. If people listened to others on how to buy stocks, no one would make money off them. Do your own research, invest in a company you trust & believe in and it may or may not work out in the long run. Stocks always rise and fall in waves trust me I have studied this for a while. Look at market saturation and such and wave count. Apple has temporarily peaked, and at most may attempt to break that wave 3 apex. E wave says waves 2 and 4 are usually corrective in either an ABC, or an expanded flat ranging from 23.6% usually a 38.2% to as low as 61.8% retrace. Corrective means ABC which is a 3, or 3 waves correction of a wave top high, which can sub divide into 5 waves a 3 wave then a 5 wave....5-3-5. Expanded Flat means the stock can retrace to 61.8% of the high and usually is also a 5-3-5, and then still can expand to wave 5 which could make higher highs if, and only if it breaks wave 3 top of $644. If this happens 1.236-1.618% expansion would be possibly $688 if the $571 low holds, or even higher if the 23.6% retrace of $510 is met and holds. $700 is possible with a possible $726 top a 1.618% expansion from the $510 lows is possible. This also means that wave 4 could go as low as $427 a 38.2% correction, which would be around the weekly 50 SMA, or even as low $294 a 61.8% retrace. Still if the lows were held and supported a wave 5 expansion of $688 and higher become relevant. Soooo.....if Apple holds $510. a 23.6% retrace it can go higher , BUT if it fails to hold $510 it could seek support at the 38.2% which would be $427. If Apple corrects back to the wave 3 top and fail this is called truncation and a major correction of usually 61.8% could happen. Fibs and pivots don't lie its all based on sentiment, and emotions! Besides E wave predicts possible wave retraces not definite, so the head line should be E wave predicts possible retrace to $510. Hell a 23.6% is a small retrace, and most are 38.2-61.8%! So don't try to put a wrench in technical's with BS sensational head lines. Apple may even attempt to retrace to $632 wave b top and fail. You watch the possible targets and adjust the stop accordingly. JCP all I can say is look at GM....E wavers all knew that dog was a dead dog when most tried to bottom pick! Most charts have a trail and the E wavers and fundamentalist all know when to follow the tape! If Apple fails to hold the 50 day SMA watch out below. If any stock fails the 50 day SMA watch out below....buyers beware! Apples wave A bottom was $571 wave B top so far $620 and could go as high as $632-$644. We will see where wave C ends and $510 the 23.6% retrace is a possible target, or if the wave B top is indeed $620.00 The stock market wave 3 top so far was 1421, and we will see where wave 4 correction stops if this is wave 4 indeed. Thanks...I appreciated the kind thought....know you all this the SPX is in possible correction mode, and so far wave A was 23.6 1357. Failing this low puts us on track to correct as low as 1321 a 38.2 or lower if 1321 fails so be careful and follow the tape. If fully invested take a little off. AS Cramer says pigs get slaughtered lol if you listen to him at all! Charts all point to a possible 38.2% correction very near! Glad I read this. It may prove valuable in the coming months. it's not just apple, no company can maintain constant upward growth. Eventually google stock will fall as well. The questions is how high can apple go? Will it really reach 1k like many investors were predicting a couple weeks ago? If they introduce some new amazing products, and actually produce a significant update with the iphone 5, I could see it happening. Not by years end I don't think, and certainly not if Google maintains the OS of choice in China. Analyst pump to get suckers, and then dump into the rise of unsuspecting buyers. Never trust lying cheating self serving analyst. Before you start hating on this truth if necessary I can prove this to a tee if necessary. Just recently an analyst said Apple will fail then it reached $644. Some will lead you to go long when they know you should reevaluate or short a stock as they and their friends are selling into the rise like that last high. I bet many are trapped at that $644 high Google has pulled back a few time and seems to always find itself back near $700. Lets just see if Apple can do this in a market where their margins are starting to fade according to the new reports! I know that dividend may be very appealing. I see they adhere to Warren Buffets advice about that finally. Thank Tim Cook for this! Cool article Alan F., thanks. As a contrarian when it comes to investing,all the signs are pointing to the obvious when it comes to Apple: Sell. To buy at this valuation is akin to financial suicide. It's time to buy apple shares.... And after, or in December sell it....n What an article. True that's a geeky writing style.